Futurologists and high-tech gurus anticipate that the next big thing in the electronics industry will be spintronics, devices based on electron spin  smaller, faster, and more versatile than today's devices, which are based on electron charge. Spin, which is assigned a value of "up" or "down," is a quantum-mechanical property of electrons. Like charge, spin can be encoded with binary data. Before the spintronic revolution can begin, however, scientists will need a much better understanding of spin currents created by the motion of electrons through a semiconductor. An important step in this direction has been taken by a team of scientists at Lawrence Berkeley National Laboratory and the University of California at Berkeley, led by Joe Orenstein, a physicist who holds a joint appointment with Berkeley Lab's Materials Sciences Division and UC Berkeley's Physics Department. By using a unique experimental technique, the research team was able to demonstrate that contrary to conventional scientific wisdom, spin current moves through a semiconductor at a slower rate than does charge current. Depending on the application, this effect, which is called "spin Coulomb drag," could prove to be either an advantage or a disadvantage for future spintronic technologies. "Spin Coulomb drag results because the motion of spin through the semiconductor is sensitive to collisions between electrons, whereas the transport of charge is not," says Orenstein. "When electrons bump into one another, the mutual repulsion of their negative charges creates a drag on their spin current, which is a relative motion between individual electrons, but not on their charge current, which is the collective transport of all the electrons in motion." Center for Spintronics and Quantum Computation. The team reported their results in a recent letter to Nature. 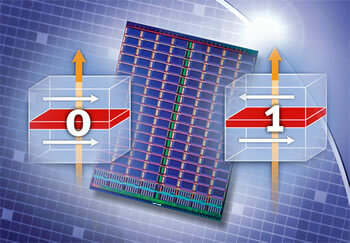 MRAM computer chips use electron spin rather than charge to store bits of data, which enables them to retain information even when electrical power is turned off. 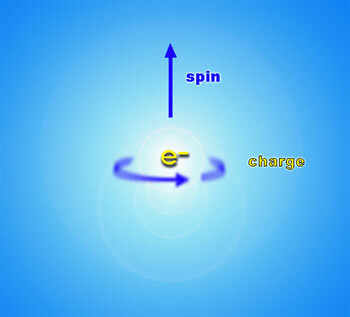 Spin is a quantum mechanical property that arises when the rotational momentum of a particle, in this case an electron, creates a tiny magnetic field. For the sake of simplicity, spin is given a direction, either "up" or "down." Just as the positive or negative values of an electrical charge can be used to encode data as the 0s and 1s of the binary system, so too can the up and down values of spin. Unlike charge-based data storage, however, spin-based storage does not disappear when the electrical current stops. Electron spin is already making its mark on the computer industry with the development of magnetic random access memory chips, or MRAMs. Computers that utilize MRAM don't need to be booted up to move hard-drive data into memory; MRAM can also store data in a much smaller space and access it much more quickly, while consuming far less power than today's charge-based memory. In the future the Holy Grail of the electronics industry, quantum computing, could be realized through the utilization of spin. Since it is the random motion of electrons moving through a semiconductor that generates a spin current (just as it generates a current of electrical charge), scientists had assumed that both currents move at the same rate of speed. Collisions between individual electrons were not supposed to affect this rate. "When talking about the motion of charge current, you can think of the electrons as acting like a swarm of bees moving in one direction. Within that swarm, individual bees might be colliding, but momentum is conserved with each collision so that the total motion of the swarm is unaffected," Orenstein explains. "When talking about the motion of spin current, the electrons act more like a swarm of honey bees and a swarm of bumble bees trying to move through one another. As the bees in these two populations collide, there is an exchange of momentum that slows the relative motion of each. Eventually both swarms may move in a single direction, but the overall effect has been a drag on their collective motion." Unknown to Orenstein and his colleagues, the effect of spin Coulomb drag had first been predicted in 2000 by Giovanni Vignale, a theorist with the University of Missouri's Physics Department, and his then student, Irene D'Amico, who is now a faculty member at the University of York in the United Kingdom. But the D'Amico-Vignale theory was received with much skepticism, so entrenched was the belief that spin current was little more than a tag-along with charge current. Orenstein and his colleagues were able to demonstrate spin Coulomb drag through the use of a technique called transient grating spectroscopy, which Orenstein adapted for his spin studies. Conventional transient grating spectroscopy is well established for measuring the diffusion of electron charge, among other purposes. Two beams of laser light on the surface of a semiconductor create alternating valence and conduction bands, which can be used to measure the rate at which the current of charge is flowing. In the variation used by Orenstein and his colleagues, the two "pump" laser beams are polarized at a 90-degree angle to one another. This creates alternating bands of spin up and spin down electrons that can be used to measure spin current. "We get a diffusion of spin because we create a situation in which there will be more spin-up electrons in one place and fewer in another," Orenstein said. To speed up the data acquisition process, Orenstein borrowed from a technique called coherent heterodyne detection (also called two-dimensional electronic spectroscopy), used by Graham Fleming, Berkeley Lab's Deputy Director, to follow the flow of excitation energy during the process of photosynthesis. Adapting the technique to transient spin grating enabled Orenstein and his colleagues to significantly increase the data acquisition rate. 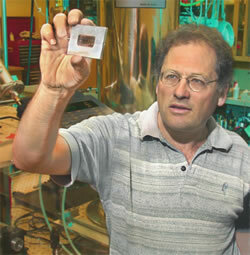 "Prior to our work, there had been virtually no measurements of spin diffusion in doped semiconductors," Orenstein said. "We were able to report more than 100 measurements carried out on a picosecond timescale." Orenstein and his colleagues worked with a two-dimensional electron gas residing in gallium arsenide quantum wells for the studies they reported on in Nature. Eventually they plan to turn their attention to multistructured nanolayers of semiconductors and to the transition metal oxides, such as the manganites, that are being used in the development of MRAM. As for what their findings on spin currents hold for the future of spintronics, Orenstein says, "Spin Coulomb drag definitely makes it harder to flow a pure spin current, but if you have a technology that calls for separate packets of up and down spin, the drag effect means those separate packets will have a longer shelf-life, and that's a good thing. You could say the impact of spin Coulomb drag depends on what kind of spin you want to put on it." "Observation of spin Coulomb drag in a two-dimensional electron gas," by C. P. Weber, N. Gedik, J. E. Moore, J. Orenstein, J. Stephens, and D. D. Awschalom, appeared in the 27 October, 2005 issue of Nature (pdf).